The Theological Hall was built under Abbot Jeroným Hirnhaim (1671-1679). The architect was a Prague burgher of Italian origin, Giovanni Domennico Orsi, whose Italian school is evident in the stucco cartouches. The Baroque concept of the library is demonstrated by the shelves; unlike the Romanesque treasury system or the Gothic desk system, the books were stored upright. Above the shelves, there are gilded wooded carved decorations with wooden cartouches. This was a rudimentary library aid, because the pictures in the wooden cartouches and their titles specified the type of literature stored on the shelves. At this time (1672) Library Rules were compiled by Abbot Hirnhaim. Fifty years later, to celebrate the 100th anniversary of the translation of St Norbert's relics (1727), the hall was extended by several metres. It was then decorated with frescoes by the Strahov Premonstratensian and painter Siard Nosecký. Symbolically, and based on quotations from the Bible (mainly Proverbs) and in part from the philosophical tracts of the hall's founder, Abbot Hirnhaim, he presented the true wisdom we acquire through piety, fear of God. In his tracts, Hirnhaim opposed scholasticism and its racionalistic understanding of the world and truth, which he believed to be false or proud wisdom. He wanted to gain an understanding of the world through true humble piety. A person enlightened by faith, however, must build on knowledge and education. 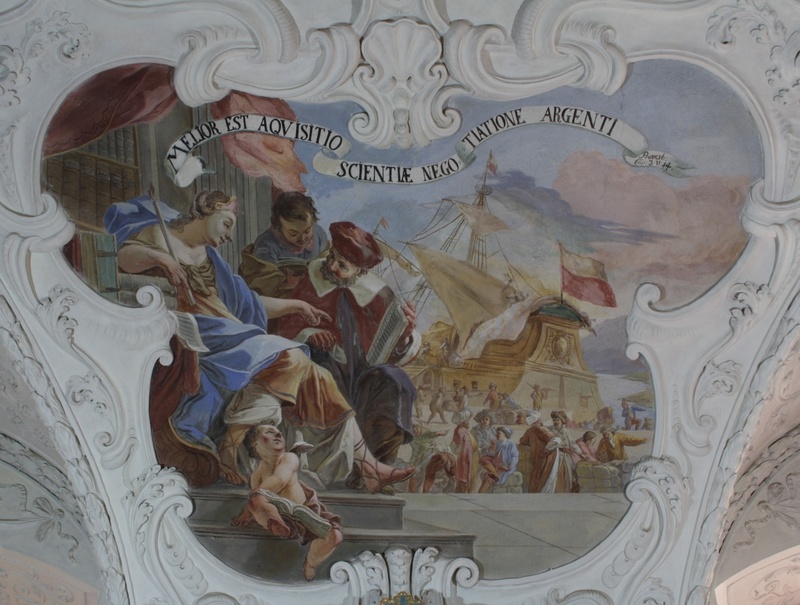 The library hosts several frescoes as a symbol of this principle. Above the forged iron gates on the other side of the library there is a small legend: INITIUM SAPIENTIAE TIMOR DOMINI - the beginning of wisdom is fear of God. It remains a paradox that the philosophical works of the library's founder were put on the index of forbidden books and were therefore placed in special locked cabinets above both the hall doors; Hirnhaim himself had these cabinets installed. As time passed, publication of his works was permitted, and they became the inspiration for Siard Nosecký. A portrait of Jeroným Hirnhaim hangs by the first window, Nosecký's self-portrait by the second. The left-hand side of the hall is dominated by a Late-Gothic wooden statue of St John the Evangelist. The link between this statue and the library is his small pouch, held by St John in his left hand. This pouch called girdle-book, although frequently depicted in manuscripts, has only been preserved in several cases, mainly because of the purpose it served - as a travel bag. It was either destroyed during journeys or cut off on inclusion in the book collection. On the right-hand side, there is a 'compilation wheel', commissioned by the library in 1678 and used to compile texts. The scribe had the various sources he was using distributed over the shelves of the wheel. The planet mechanism means that when turned, its shelves were kept at the same angle so the books are not liable to fall. A number of globes (both astronomical and terrestrial) line both sides of the Theological Hall. Some of them come from the workshop of the Rotterdam-based family Blaeu, which specialized in manufacturing maps, atlases, and globes over several generations in the 16th and 17th centuries. Over 18,000 volumes are stored in the Theological Hall. The name of the hall comes from the content of these works. The northern wall contains nothing but different editions of the Bible or parts of the Bible in many languages. In 1993 and 1994, the interior was restored; the shelves were completely dismantled and the wood was treated. At the end of the 1980s, the original red paint was discovered under the later blue-grey paint, and this red was used in the restoration as the oldest layer. The parquets from the 20th century were replaced with a historically and aesthetically more accurate copy of the original Baroque flooring. The original visitors' route went through all the main areas of the library. After long-term readings were analyzed, the tour was adjusted to the current version, as the humidity in the halls fluctuated so much during the day that the good condition of the frescoes and book bindings was in jeopardy.